The T5 Duo utilizes the reliable Dura Life™ Diaphragm with one moving part to ensure a long lasting and easy to maintain cleaner. The Dura Life Diaphragm provides maximum durability and silent operation. The Duo Disc System achieves a closer clean with two independent discs for enhanced coverage, greater pool adhesion, and flexibility. The fins allow unimpaired cleaning over lights, main drains, and wall fittings that may hang up other cleaners. Adjust the wheel deflector as needed for fluid navigation around corners, steps, and ladders. The quick connector enables the wheel deflector to attach quickly and securely to the cleaner head. 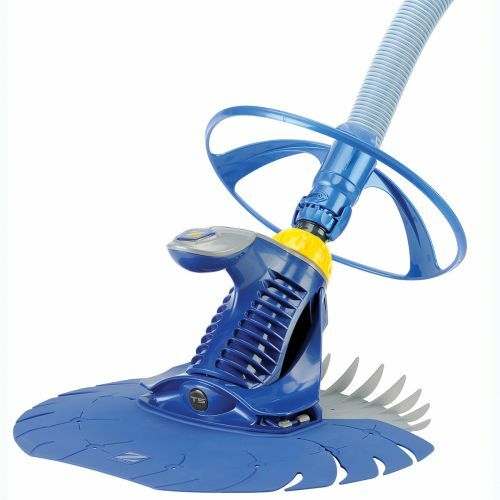 The T5 is for use with Low Flow Pumps, it includes twist lock hose for simple connection, can be used on all pool surfaces, and has 39 feet of twist lock hose (12 sections, 1 meter long).